I’m shallow. In the words of Charles Barkley and my friend Deborah’s son Carter, this is a “turr-ible” character flaw that I have managed to outgrow in all areas of my life save for two: the appearance of my children when fully clothed and my selection of reading material. While I certainly threatened it plenty of times, I stopped short of divorcing either of my husbands for how they allowed my progeny to parade down grocery store isles or the halls of their elementary school dressed like clown school dropouts when outside of my presence. Just ask the Sweet Potato Queen Jill Conner Browne, and she’ll tell you that such an atrocity is justifiable grounds for divorce among Southern women. Yes, I like my kiddos’ socks to match (despite the growing trend of miss-matched socks among tween girls…in vibrant neon animal prints no less) and for them to refrain from sporting clashing prints and patterns above the ankle altogether. It makes my day for one of my children to stroll into a room and ask, “This okay?” as opposed to running out the door in Lord Knows What. I get that I’m not doing them any favors. They probably shouldn’t be standing in front of their closets every morning agonizing over whether or not I’ll approve of their wardrobe choices…wait a minute. Scratch that. Yes, they should. I’m jumping on the WWJD bandwagon with my own line of “WWMW: What Would Momma Wear?” bracelets. No more Daisy Duke bootie shorts and pants on the ground, it’s belts and Bermuda shorts all around. I am beginning to mellow a little in this area. Number Five has been wearing a multi-colored tutu over her pants everywhere we’ve gone this week without much fuss from me. 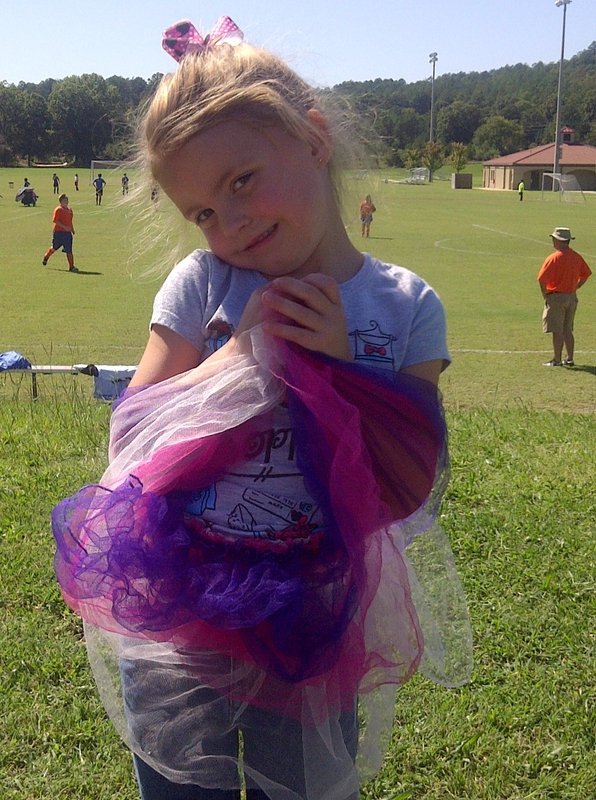 Here she is at a soccer game this weekend. I’m also a sucker for a great book cover. While on a recent shopping trip to Douglasville, GA for Homecoming attire, I was able to visit a closing Borders bookstore. There were so many great deals to be had among the items marked down 60-80% that I didn’t know where to start. I made my way to the Young Adult section and picked two titles based on their cover art alone: The Grimm Legacy, by Polly Shulman and Rot and Ruin, by Jonathan Maberry. This made me realize just how often I choose what to read next based on the look of a cover. Sure, there are a few books I pick up after reading a great review or at the suggestion of someone I follow on Twitter or through a blog, but for the most part it’s a cover that wins me over. A perfect example of this is the story of how I discovered D. M. Cornish’s Monster Blood Tattoo Trilogy. 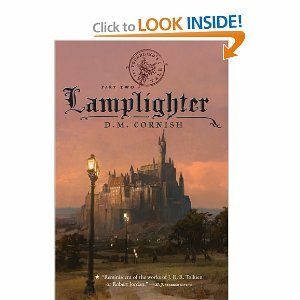 I found the second book of the series, Lamplighter, while perusing the shelves of a local library. When the cover’s bold colors and beautiful artistry caught my eye, I read the jacket and knew that I’d found my next great adventure. 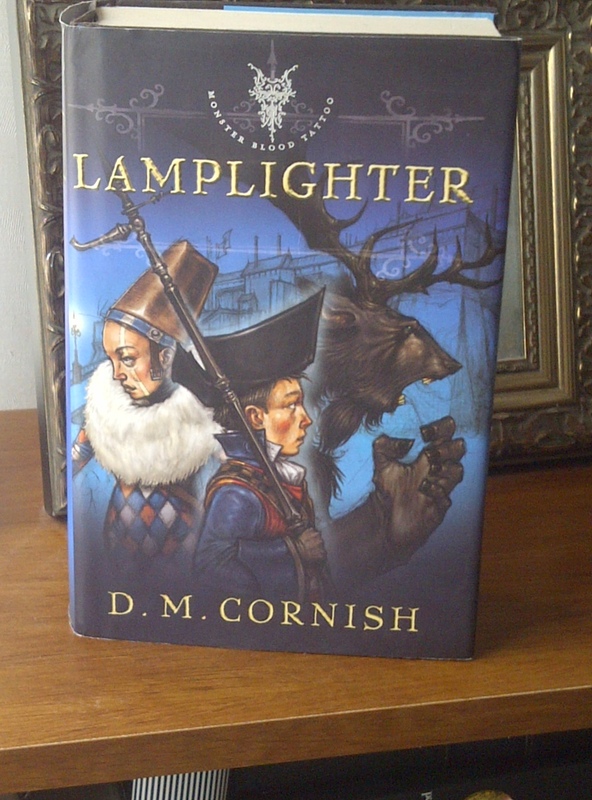 Mr. Cornish is the illustrator as well as the author. On top of being shallow, I’m a tad obsessive/compulsive and had to purchase a copy of Foundling, the first installment of the trilogy, before reading book two. I fell in love with the story of Rossamund Bookchild and his adventures in the world of the Half-Continent and quickly devoured Foundling and Lamplighter. I would have to wait almost two long years for the third and final installment Factotum. 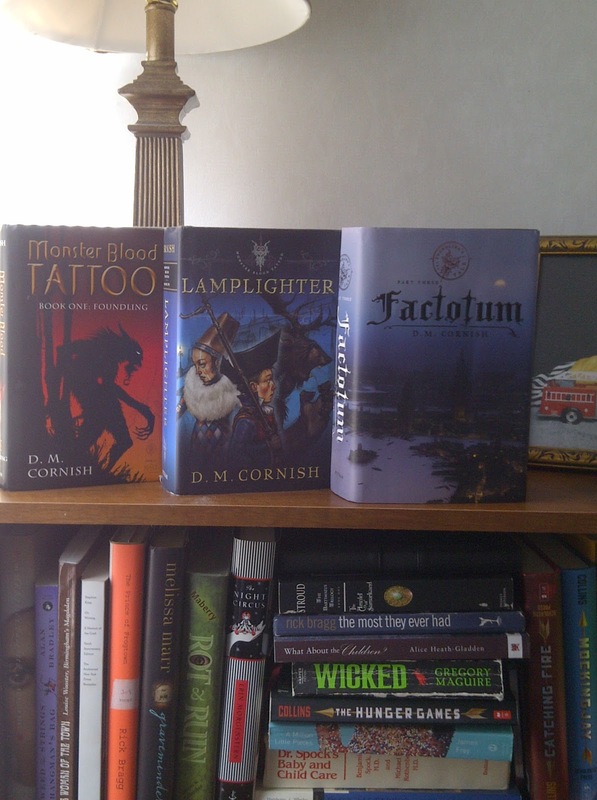 In the interim between books two and three, Putnam, Mr. Cornish’s publisher, changed the name of the series for U. S. publication to The Foundling Trilogy. Supposedly the new title is more palatable to American readers. They also changed the cover art. I was disappointed with both. There’s no way I would have picked up the book in the first place under the new packaging. The new covers and titles are okay, I suppose. They just don’t captivate me the way the originals did. I hadn’t much choice when it came to Factotum. I was only able to find it under the new name and look. 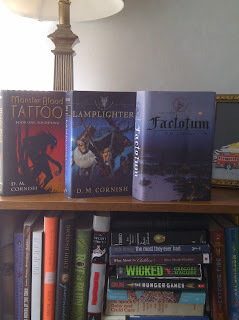 It still makes me a little sad to see it lined up next to its bolder brothers on my shelf at home. It’s similar to the way I feel seeing one of the boys dressed in purple stripes and red checks or Dan in her tattered tutu next to the other kids looking perfectly presentable in their Mom Approved outfits. So, what about you? Which books have you chosen based on their covers alone? Were you ever disappointed by having done so? For my next post, I’ll be interviewing local author Randy Martin and the illustrator of his book Introrse, Jason Wright. And I’ll be posing these questions, among others, to them as well. By the way, that computer science class is paying off! I finally learned how to include photos in my posts. It’s been a while since my last post. I have a good excuse, though. I’ve been back in class at JSU since the fall semester began a week ago. I’m sitting for two classes and taking two more classes online. It’s been a bit of an adjustment, to say the least. I’m getting up at 5:30 a.m. in order to get the older kids on the bus by 6:30, the baby to daycare by 7 and myself to class by 7:30 Monday thru Friday. Then it’s off to work until 4, volleyball, football and/or soccer practice, homework (the chirren’s and mine), dinner and, if we’re lucky, showers all around. As if my weekdays weren’t enough to make me drop dead from fatigue, I’ve been spending my weekends at volleyball tournaments and peewee football games around the county. I’ve not had much time to read or write anything for fun in weeks. I am enjoying being a student again, however. I was elated on the first day of my first class, Political Science, to discover that I am neither the oldest nor the fattest in the class. Hooray! This made it much easier to focus on the subject matter and not worry about my superior life experience and sheer physical mass intimidating my classmates. Sadly, I wasn’t as lucky in Oral Communications. This is my own fault—I put this class off while attending in 1996-1997 and 2002. I was almost late the first day the class met. I didn’t know it at the time, but so was the professor. I walked into a room of shiny newborn babes (by some miracle already possessed with the ability to talk) who began to echo the phrase: “She’s here. She’s here!” as soon as I entered the classroom. This was followed by a collective and disappointed “Oh!”, when I sat down in a desk just like the rest of them. They thought I was the dang instructor! I learned during a subsequent meeting that I am the only person with children in my Oral Communications class. Well, besides the actual instructor, who has one son, but I’m not really even sure she counts, seeing as she only has a singular offspring to contend with. My online classes offer the luxury of anonymity. I know from the message boards of my Art Appreciation class that I am certainly not the only dinosaur returning to finish my degree. Many of my virtual classmates are parents as well. I’m trying hard not to be so hung-up on the age thing. I’m working to put it out of my mind altogether during class. I was doing a pretty good job of it this morning in Poli Sci until a young guy, clad in black jeans and shiny Doc Martin’s almost pushed me over the edge. It was my first occasion to sit next to him. He was late for class, probably due to the abysmal rain we’ve been experiencing for three days straight here in Alabama, and took the available seat across from me, where he proceeded to sigh loudly and grunt every time the instructor gave the name of some contributor to American political culture. Voltaire…sigh. John Locke…sigh, sigh. Thomas Jefferson…sigh, grunt, sigh. He’s obviously got some strong political views and doesn’t think any of those guys got “It” right. And why shouldn’t he? He’s 20 years old and knows it all. I wanted to knock the placenta off his face and him out of his Doc Martin’s with my 20 pound text book. I’m hoping my return to the halls of higher learning doesn’t land me in an Anger Management class. You might be surprised to know that the biggest dilemma I faced while readying myself and the chirren for our cruise last week was not how to accommodate eight bathing suits, twelve pairs of flip-flops, 30 pairs of underwear and a mountain of other foolishness in the mere three pieces of luggage allotted to me by my Dear Mother, but rather what reading material I should take with me to the Bahamas. I did a little research, looked into suggestions made by other travelers, contemplated classics like Treasure Island. I even considered something frivolous—I was going to be on vacation after all. Celia Rivenbark’s new book You Don’t Sweat Much For a Fat Girl was especially tempting, but me sitting on the deck of a cruise ship snorting…and I mean through both nostrils and choking on my own saliva the way all Ms. Rivenbark’s books are known to make me do…didn’t fit very well with my fantasy of lounging on the Serenity Deck, cocktail in hand, with the sound of the massive ship gliding smoothly through the royal blue waters of the open ocean lulling me into total relaxation. What to read was the hardest decision I made about my trip. Harder than deciding which fine meals I would indulge in at the formal dining…would it be Baked Alaska or another serving of Warm Chocolate Melting Cake?... harder than deciding whether I would bother to get dressed for the day at all or just frolic around in my bathing suit for twelve straight hours, harder than deciding how I would gamble in the casino…the slot machines lit up and made delightful noises when you won, but the dealers at the tables would flirt with you for tips. Can you see the predicaments I faced? Any-who, what I chose in the end came as quite a surprise. After much research and thumbing through many books at Books-A-Million and the Anniston Public Library, I was drawn to and ultimately selected Rick Bragg’s The Most They Ever Had, a collection of stories about the mill people of my very own home town. I’ve loved all of Pulitzer Prize Winner Rick Bragg’s books—if you’ve never read All Over but the Shoutin’, Ava’s Man or the Prince of Frogtown, each a separate telling of Bragg’s family history, then you don’t know what you’re missing—and The Most They Ever Had didn’t disappoint. It was especially interesting to see from a literal distance the people of the mills Bragg writes about, the people I have lived with and alongside while taking them for granted my entire life. I never made it to what I am beginning to believe an invention of my Aunt Gwen and Dear Mother, the fabled Serenity Deck. I couldn’t escape all those kids of mine for long enough. Truth is, I barely had time to read while actually on the ship and I was too worried about one of the little beasties drowning while at the beaches. I did, however, have occasion to read on the ride home from Jacksonville, FL thanks to Aunt Gwen’s desire to always be the driver and never the passenger on road trips. As punishment for keeping me otherwise engaged most of the cruise, I read the majority of The Most They Ever Had aloud to the chirren in the van. “Shut up and learn about the culture of your people!” I could be heard shouting over the den of noise between chapters. It was great! They listened, reluctantly at first but eventually with interest. It didn’t hurt that I’d threatened them with the additional torture of an actual book report if they didn’t cooperate. God, I love being a mother. In the words of Mr. Bragg, The Most They Ever Had is “a mill story; not of bricks, steel and cotton, but of the people who suffered it to live.” It’s the story of my people, my great-grandmother Aggie, my grandfather Jack, my grandmother Rosa and the town where I was raised. It is a story I may not have appreciated fully if I’d read it just five miles down the road from the now silent and dismantled mill of its pages.